Giving Trixie time to get used to the carrier was a huge help. 1. Let her get used to the pouch. While Trixie has never been one to hide when I bring her regular carrier out, she’s also not exactly in love with it. 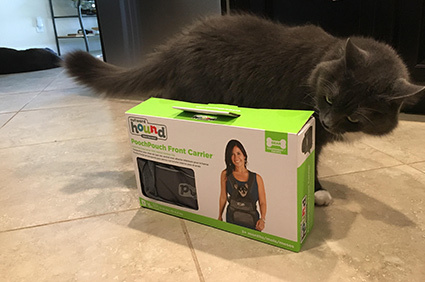 The first step was just to make sure that the presence of the new pouch carrier didn't freak her out. I made a point to leave it sitting out near some of her favorite spots. I sprinkled some catnip in it. I wore it while sitting on the couch, allowing her to investigate in a safe way. She’d come up and sniff it, maybe rub on it, but I didn’t pressure her to get in. I put some of her favorite treats inside it, but that wasn’t enough to entice her to crawl in. That wasn't a surprise, though, based on our previous experiences with her and carriers. She's really not a den cat. She doesn't even like boxes! 3. Next came the big test: Encourage her to actually get into the pouch. The previous steps went smoothly as can be, but this… this was a little more trying. I began by placing her back feet in the pouch on our usual walk over to her food bowl. It didn’t exactly thrill her, but she didn't try to escape. The first time I walked out onto the screened-in lanai with her partway in the pouch, though, she was clearly less thrilled — her body language indicated stress, and she made movements to get out — so I quickly obliged. A few more tries — always with more catnip sprinkled in before, and always with rewards like treats or special wet food provided after — and she began to get used to the idea. Then, it was time to take the whole show outside. 4. Venture outdoors with Trixie in the pouch. With her harness secured to the safety attachment in the pouch, I made my move from the lanai to the yard. Trixie initially seemed a bit surprised to find herself in the great outdoors, but mostly she appeared interested in what the dogs were up to. We've only extended our outdoor adventures to a couple of minutes at a time — the moment Trixie seems startled or at all uncomfortable, I head right back in and set her free. It's not a walk, but it's a start! And I remain hopeful that it'll lead to us being able to take a safe, secure (and short) little walk with all of our four-legged friends this summer.